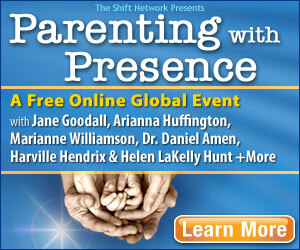 I didn't want you to miss this upcoming free online Parenting With Presence Summit! We’re there to experience the irritation, frustration and even anger, when faced with negotiations and power struggles – over everything from homework to brushing teeth to bedtime. As a parent, we know the beauty and blessings that our children bring into your life. We also know the challenges that come with raising a child. The little bundle of joy that arrives in our world (without an owner’s manual!) magically transforms into a toddler, and eventually, a teenager. And we’re there with them every step of the way – through the ups and downs, the joys and sorrows. And we're also there for the indescribable sweetness – moments when our kids surprise us with their curiosity and heart-melting innocence. Through all the challenges and joyful moments, we are given an opportunity to grow, expand and evolve into a more effective parent – and a more conscious human being. That's why I'm thrilled to share with you and invite you to the free online Parenting with Presence Summit, March 18 – 21. The Shift Network and Susan Stiffelman – author of Parenting without Power Struggles and parenting columnist for The Huffington Post – have brought together 20 of the world’s leading parenting experts and thought leaders to explore how to grow as a parent and raise more joyful, resilient and authentic children. When you register for this free event, you’ll have access to profound conversations with parents and parenting experts like Arianna Huffington, Marianne Williamson, Jane Goodall, Harville Hendrix, Dr. Daniel Siegel, Dr. Daniel Amen, Congressman Tim Ryan, and so many others. I hope you'll join me for the online Parenting with Presence Summit! P.S. Please help spread the word about this important event. The future of our world literally rests in the hands, minds and hearts of our children. The more we can do, as parents, to prepare them for this responsibility–the more beautiful our world will become.